The front yard nectarines are days away from exploding into ripeness. It’s a yearly race to harvest at peaking ripeness, but before the neighbors and dog walkers notice the dangling juicy orbs, denuding the branches of their bounty. In preparation for a potential nectarine jam session (of the Ball jar kind), I’ve been limbering up with a few marmalades. Last weekend was a batch of my favorite mouthwateringly tart lemon marmalade, from Susan Feniger’s Street cookbook. Today, I tested a savory Fennel-Orange Marmalade, only slightly adapted from Cat Cora’s recipe. Almost chutney-like in consistency and flavor, I’m envisioning spoonfuls crowning halibut steaks for July 4th. Heat fennel, onion, sugar, juices, and water in a saucepan and bring to boil. Reduce heat and simmer for 45 minutes. Add zest, chopped orange, and ginger. Simmer for another 15-30 minutes, stirring occasionally. Watch closely toward the end to ensure marmalade doesn’t burn. Once thickened and gelled, take off heat, add salt and thyme. Use your standard canning process if not consuming within two weeks. 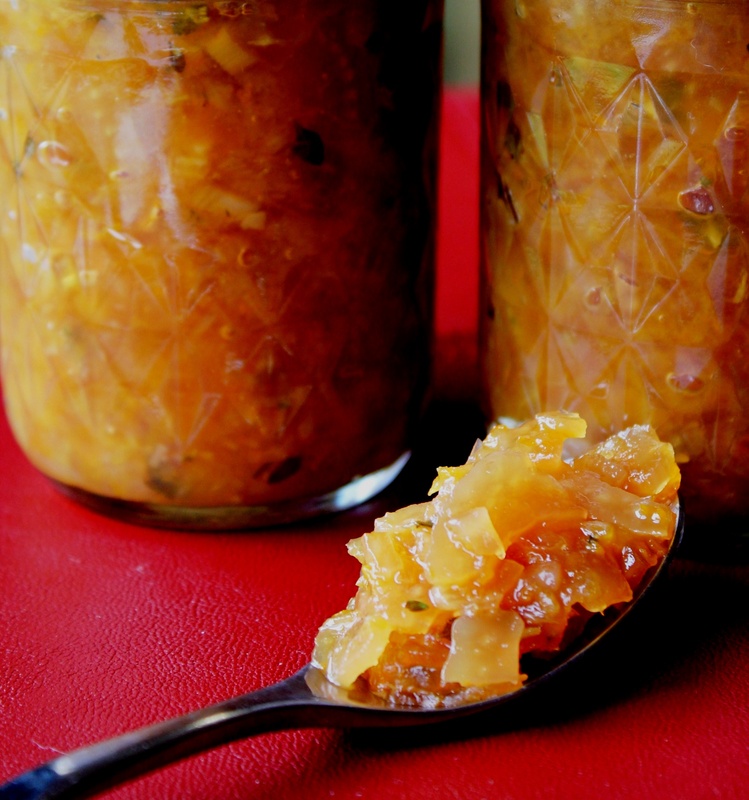 This entry was posted in Condiments and tagged canning, Cat Cora, Fennel Orange Marmalade, marmalade, marmalade recipe, Recipe by Julie "Phoren" Seyler. Bookmark the permalink.